Recently, I’ve received several emails regarding iOS 10.3 calendar event missing recovery. The usage of Calendar apps enable every Apple users to schedule their daily works, appointments, events anytime or anywhere. It might will interrupt your daily schedule if you accidentally lost your scheduled calendar events for various reason such as iOS upgrade. Fortunately, if you have backup them earlier like the user above, don’t worry, here we will guide you how to restore iPhone calendar after update to iOS 10.3 from iPhone backup. An easy way to find missing calendar events only from iPhone backups. Keep reading. You might interested: Contacts Missing After Update to iOS 10.3, How To Recover? 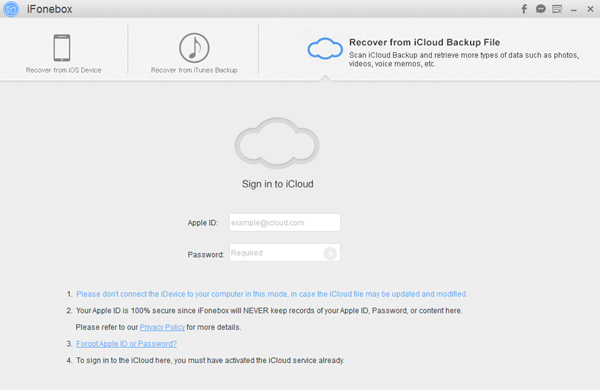 You may access to your iTunes/iCloud backup files if you have backup them earlier. Connect your iPhone with iTunes on PC or log in to icloud.com to restore your Calendar. Bear in mind that using this method, you might need to restore the whole backup files instead of Calendars only, your current data of your iPhone will get overwritten by the backup files. Approaching to an iOS data recovery tool to find your lost calendar events on iOS 10.3 iPhone. The iOS data recovery tool like iFonebox able to help you find disappeared calendar events on the new iOS 10.3 even if you have backup or not. You may also find lost calendar events selectively by using iTunes/iCloud backup selectively but not restoring whole backup files. Besides calendar events, iFonebox able to help you to recover up to 16 data back if you accidentally lost it during new iOS upgrade. In this article will briefly explain how to use an iOS data recovery tool to restore Calendars from iPhone backup after update to iOS 10.3 with simple few clicks. 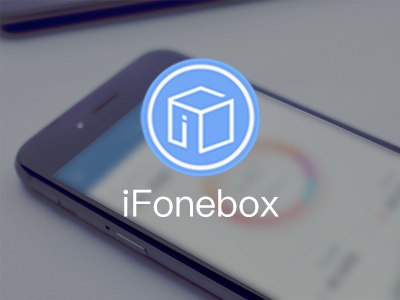 Download and install iFonebox is a must before we begin this iOS 10.3 calendar events missing recovery. iFonebox is compatible for Windows version & Mac version. Select the version based on your computer system and begin the download. Here we’ll be taking Windows version as an example. If you are a Mac user, you are able to follow the same methods and steps below. Select the backup files you want to recover and then click “Download”. 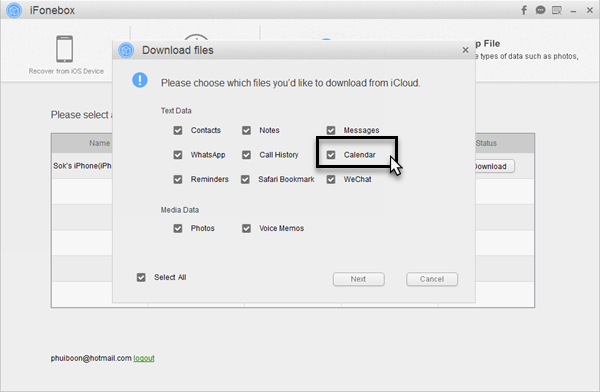 You may only select Calendars to download during this recovery to reduce the download time. 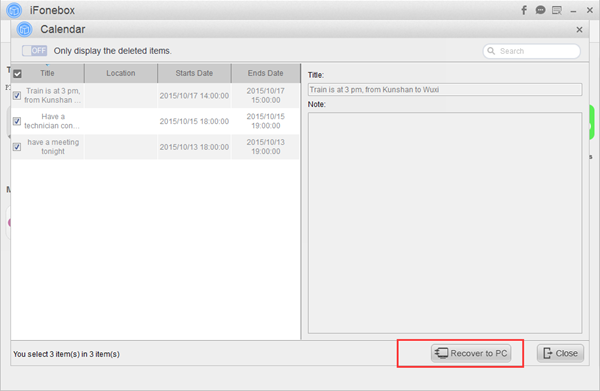 Next, select “Calendars” item from downloaded backup files and click start scan. After scanning, turn on the button “Only display the deleted items” to narrow down the results if you only looking for missing calendars. Preview and pick the Calendars event you want to recover and tap “Recover To PC” on the bottom right. By now you should be able to view your Calendars on your PC. Congratulations! Your missing Calendars has been successfully recovered. If you have iTunes backup, you may choose the second method “Recover From iTunes Backup” and begin the iOS 10.3 calendars recovery within the help from iFonebox. Kind reminder: to avoid data loss, you may can backup them before iOS upgrade or any time.